If God shuts a door, quit banging on it! Whatever was behind it, wasn’t meant for you. 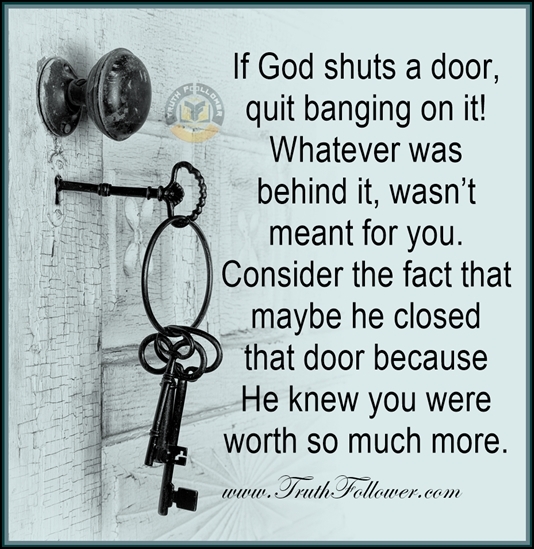 Consider the fact that maybe he closed that door because He knew you were worth so much more. God has a great plan for your life. He is directing your steps. In His perfect timing, everything will turn out right. Sometimes I don't understand why things happen the way they do but I know in the end that God has a plan. God has a reason for allowing things to happen. We may never understand God's wisdom but we simply have to trust God's will. God bless you all the way. God has a great plan for your life picture/image is an Inspirational Stuff to Inspire and Motivate You. You can download pics by just clicking on the Images. Thanks for visiting Truth Follower an online place for huge collection of inspiring pictures, quotation, and Sayings Images. If you like God has a great plan for your life, Please Share with friends and family on Facebook, Twitter, and Pinterest.